여행중 긴급한 상황이 발생하면 24시간 전화(82-2-3449-3500)으로 연락주시면 한국어로 필요한 서비스를받으실 수 있습니다. When you need assistance, please call 24 Hours Emergency Assistance Hotline at(82-2)3449-3500. You will be asked the claaer`s name, caller`s location, caller`s contact numbers (telephone,mobile and fax number) and patient`s name, patient`s condition, patient`s location etc. 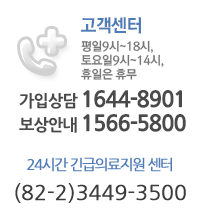 미국 캐나다 지역 클레임 서비스센터: 전화 1-800-262-8028 (당사가 통화요금을 지불하는 무료전화이며, 공중전화에서도 통화가 가능합니다). 단, 한국어 서비스가 되지 않아 영어로 통화하셔야 합니다.